My movie review of Wonder Woman is live at the Independent Institute. I really liked the film, and, as I mention in another blog post, I think this might be a break through film for women directors. The film is smart, well executed, and superbly directed by Patty Jenkins. Perhaps one of the elements I appreciate the most is the multidimensional development of the main character, Diana Prince (Wonder Woman). She doesn’t lose her gender identity as she embraces the superhero role and heroic commitment to saving the human race. Diana Prince is not a character that essentially acts and looks like a man. Kudos to screenwriter Allan Heinberg for scripting a great character and giving her a worthy arc. Jenkins has also done an excellent job blending an international cast and using the story to play off their differences. Their differences become humorous interactions that deepen relationships and understanding. 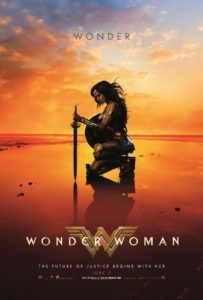 Wonder Women contains an excellent story in a well-executed film that grapples with the conflicts between idealism and practicality, innocence and experience, gullibility and wisdom. Jenkins has crafted a film that infuses substance into a smart story. She uses well-crafted storytelling elements, such as defined and complex character arcs, to allow the anti-war social conscience that underlies the film to shine and provide a compelling context for the film. This is great summer film—a lot of fun with great action sequences and excellent character development. Stay tuned to this blog because the film is prompting me to think about several other articles on plot development and character development using Wonder Woman as a starting point for the riff. This entry was posted in Characters development, Film Reviews, Films, Independent Institute and tagged Allan Heinberg, character development, female directors, film review, movie review, Patty Jenkins, Wonder Woman on June 24, 2017 by SR Staley.